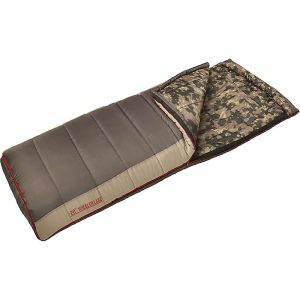 I heard about the Coleman Big Game sleeping bag when planning our car camping trip to Montana and Wyoming, and wanted one to work with a Coleman that served us well. Our colossal is rated 20 degrees (5 pounds of hollow - core insulation) but really does not work with very cold nights at those altitudes. Actually, we had trouble sleeping on a camping trip to Bryce Canyon National Park in April during a snowstorm and night temperatures dropped to 18 degrees. My service dog wanted to join me in my sleeping bag despite his own, another 4 pounder Kelty. So I went to a number of e-commerce providers, comparing offerings. 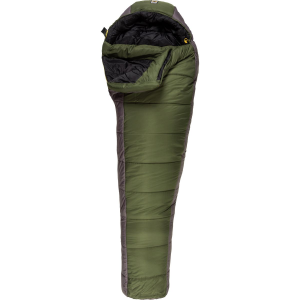 I placed my order after finding Amazon had three Big Game sleeping bags in stock for immediate delivery. That afternoon I received confirmation, but noting there would be a week-long delay before shipping. But, I could pay extra and receive two-day shipping; they would find one of the bags and ship it out immediately. So much for free shipping that comes with a large purchase you make at Amazon! The alternative was to use one of Amazon's partners, sponsored links like Meijer, Campersland, Campmor or Sunny Sports, because they do ship within a day upon receipt of an order. But with Amazon if you opt to use their Super Saver it will take over a week before they will even process it, and then you wait until it gets through the UPS system. And Amazon will "lock in" your order upon their receipt of it and only allow a "customer" to pay more - rather than cancel. So after waiting for over a week for the order to be processed (they notified me it was shipped exactly one hour after the seven days wait was up) I will make sure that it is the last order that will be placed with these marketing geniuses at Amazon. I really wanted the sleeping bag because the weather up north, with Spring waiting until July, can be a little cold in a tent. But the Big Game was a disappointment upon arrival. First, it is not 40" x 84" as claimed; it is actually 38" by 81+." Maybe that isn't significant, but I paid for the larger sleeping bag - for my dog and self. Yes, it is a big bag in any event; it just is not as advertised! The so-called flannel liner is the interior lining of the bag and it cannot be removed between camping trips for laundering, as some other Coleman bags I have. It creates a problem because we camp out for three or four weeks at a time, three times a year, visiting national parks, monuments and forests in the Rocky Mountain area. This means that you must find a commercial laundry to keep the sleeping bag clean from the oily skin buildup - unlike many others in this price range. And it is just too darned big for even new front loading machines. Their suggestion: if a commercial machine is not available, hand wash it in a bathtub! As for the "pillow," I would rather use a rock than what Coleman and Amazon have described as a pillow. It is next to nothing and the filling, despite some work on it prior to use involving steam, lumps up so that it actually should be described as half the size. Please forget the pillow and look for a lower the price. But don't regard that matching item as a deciding factor. Lastly, don't rely on temperature ratings. Just like when they say a tent sleeps six it is a slight exaggeration - to say the least. 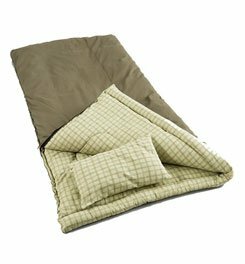 While a sleeping bag may be rated at minus 5 degrees, it could be comfortable down to 15 or 20 degrees. The so-called comfort rating includes wearing additional thermal underwear and sox, along with a hat and gloves, some things that you can't be comfortable sleeping in. And at 75 years young, I still would like to get out of those things I wear all day. I will say that the ten once cotton canvas cover, while it adds a lot of extra weight, makes this a good addition to the car camper's equipment. But I wonder why they hide the fact that the reverse side has a sewn addition to the cover, making it in two pieces instead of one. So instead of taking three sleeping bags, in case it got extra cold, I packed just two, opening the Big Game and using it as a comforter until it got too warm. It will spread out and the extra hollofill will provide that little degree of warmth that was lacking at Bryce Canyon. I just wish it had those four extra inches that we paid for when we ordered it. I would have rated it three stars, but the delay in sending it out on the Super Saver just isn't something that I countenance. I don't really like to be snookered, and Amazon left me with that feeling. The Coleman Big Game -5 is not available from the stores we monitor. It was last seen May 3, 2017	at Campmor.